Anjaneya, a devotee of Lord Rama. He is the son of Kesari and Anjana and is commonly known as the son of Vayu (The wind god). 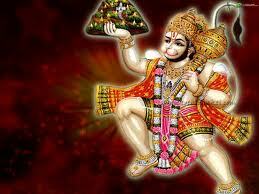 Anjaneya Stotram is a popular prayer dedicated to Lord Hunuman. It has popular slokas like Anjana Nandanam and Manojavam marutha tulya. Here is the English lyrics of Anjaneya stotram. Ajadyam vak paduthwancha hanumath smaranath bhaveth.